It is no news that a foreigner rules Nigeria from Aso Rock. Despite all the revelations by Nnamdi Kanu to Nigerians about Jubril Al ‘Sudani, the Impostor is still presiding over the affairs of the country. The scientific proven evidences that Nnamdi Kanu presented to back up his claim was enough for Nigerians to revolt, instead of revolting and taking actions to chase Jubril away from the country, Nigerians rather prove Nnamdi Kanu right that "the brain of a black man is lower than that of an animal" and further confirms that "the brain of a baboon living in the forest is better than the brain of an average Nigerian". Today, the Impostor has promised Nigerians "next level" on the platform of APC to run Nigeria for the next four years. Sadly, imbecilic Nigerians see nothing wrong with a foreigner ruling them. 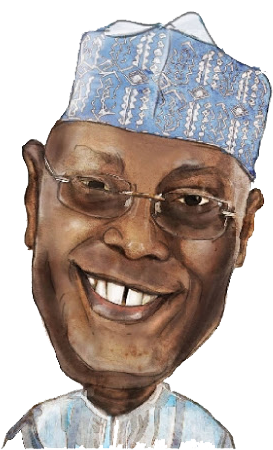 The PDP presidential aspirant Atiku Abubakar who is the main sponsor of Boko and originally is a Cameroonian and only became a Nigerian on 1961 when part of northern Cameron was merged together with Nigeria and named Adamawa state, has also joined the league of the Coup plotters. This same Atiku Abubakar was the one who told Nigerians to abandon PDP and join him in APC together with the Yorubas to vote in the late tyrant president Muhammad Buhari into power which they did swiftly with the help of their killer machinery Boko Haram. Now both foreigners are in the league of Nigerian presidential jamboree called 2019 election. Seriously Nigeria is not supposed to exist as country, how can Nigerians happily embrace evil in this 21st century? A foreigner, an Impostor Jubril from Sudan as their president now they are happily cheering up another foreigner Atiku Abubakar to run for presidency this February 2019. Biafra referendum is the only way out. February 16th is the date, instead of going out to vote for foreigners it is better for you to join Biafrans to sit-at-home and watch as the fraudulent constitution shred to pieces.